When working with some powered industrial trucks the possibility of serious injury or fatality is a real consideration. According to OSHA, forklifts cause about 85 fatal accidents per year; 34,900 accidents result in serious injury; and 61,800 are classified as non-serious. Industrial Truck Association (ITA) reports that there are about 855,900 forklifts in the U.S. Therefore, over 11 percent of all forklifts will be involved in some type of accident each year (assuming only one accident per forklift). The ITA also reports that the useful life of a lift truck is about eight years. This means that about 90 percent of all forklifts will be involved in some type of accident during their useful life–again assuming only one accident per forklift. Operating this equipment almost guarantees an accident at some point during a career. To help reduce the possibility of being injured, it is important to understand where and how these accidents occur. Training can also prevent or reduce the severity of an accident related to the stability of a lift truck traveling with an elevated load. Keep the load as low as possible to increase vehicle stability and to help prevent tip-over accidents. Even if drivers ignore this rule, and the vehicle tips over, injuries are usually minor if they stay with the vehicle instead of jumping off. The normal tendency is for a person to jump downward, so the driver lands on the floor or ground–usually directly into the path of the overhead guard. The most common result is a crushing injury to the head, neck, or back where the overhead guard strikes the employee. Forty-two percent of forklift fatalities are caused by the operator trying to jump from a tipping vehicle. That is why a forklift license or certification is required including a certificate for passing a forklift training course and proof of competency. Powered industrial trucks, commonly called forklifts, fork trucks, or lift trucks, are used in many industries, primarily to move materials. They can also be used to raise, lower, or remove large objects or a number of smaller objects on pallets or in boxes, crates, or other containers. Powered industrial trucks can either be ridden by the operator or controlled by a walking operator. Over-the-road haulage trucks and earth-moving equipment that has been modified to accept forks are not considered powered industrial trucks. AGVs that do not require a driver can be operated remotely, with 24/7 IIoT (Industrial Internet of Things) monitoring. They can be operated in a lights-out operation and avoid safety challenge of standard fork trucks including the fatal and dangerous operator errors describe above. 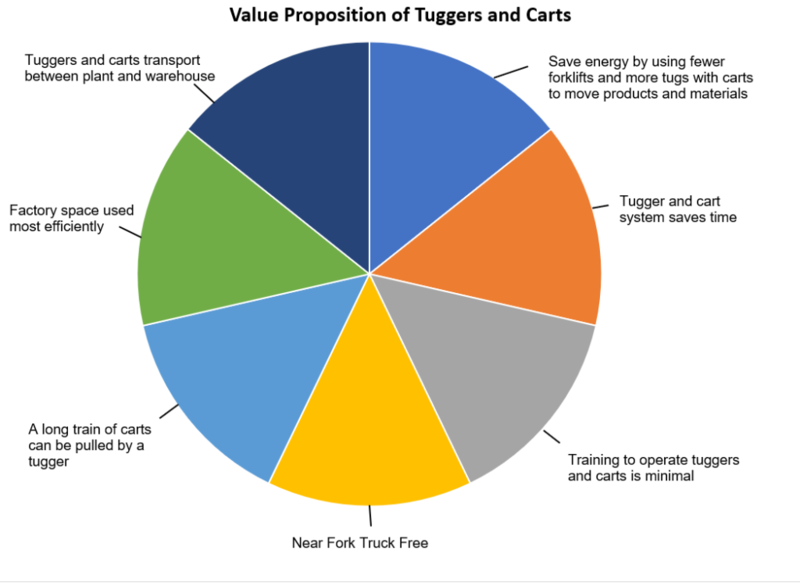 Beyond the Lean manufacturing benefits of Forktruck Free operations, the number 1 factor driving this shift away from forkt rucks is to reduce the hazards related to powered industrial trucks. AGV driverless tugger pulling carts have been determined to be the best way to protect workers from injury. While employers must ensure that each powered industrial truck operator is competent to operate a powered industrial truck safely, as demonstrated by the successful completion of the training and evaluation specified in 29 CFR 1910.178(l)(1), autonomous self-driving vehicle mitigate this expense and concern. It immediate removed liabilities legally, financially, and ethically. Companies often hire outside firms to train a trainer at an average rate of $3000. Instead the 24/7 remote monitoring removes this cost and requirement. The fear of non-compliance is immediately eliminated when OSHA inspectors are randomly checking companies. The fines and penalties are avoided. The tugger AGV vendors will provide complete instruction with implementation. Topper has pioneered and patented equipment that enhances both safety while developing ease of use products (requiring the least amount of training without compromising safety.) As experts in Lean Material Flow remove forklifts in heavily populated manufacturing areas allows for efficient waste reduction, flexibility, and training cost savings. These strong incentives and years of on-site customer expertise bring the exact best-practice solutions. Tilt Carts from Topper Industrial were first introduced in 2000 and now use a patented hydraulic speed dampening cylinder that manually adjusts to slow the tilt of a fully loaded unit that may weigh up to 2500 lb. This allows the operator to push the cart into the desired position and tilt a load of parts into an easily accessible picking position that requires minimal reach and lifting or training. Besides the safe tilt control, the unit uses a spring-loaded lock-pin to lock the base in the tilted and upright position. The lock-pin actuates with minimal effort by a hand lever built into a 1¼ in steel push handle. The standard structure of all models of Tilt Carts consist of rigid structural steel tubing, ¼ in steel corner guides, six Toppster caster wheels configuration and floor lock. Tilt carts can tilt in increments with a hydraulic or pneumatic lift-assist that returns partially emptied loads back to their upright position. The carts have a rhino-lined deck for noise reduction and skid resistance and have a baked-on powder coat for a durable long-lasting finish. Cart options include a pintle ring and auto coupler tow package or a Topper easy release hitch and coupler tow package, an auto floor brake that requires no floor lock and can only be disengaged by depressing and holding the handle lever that automatically engages when released, and lift guides that are used with pneumatic or hydraulic lifts. All these patented and tested products reduce the need for training; quickly demonstrated adoption and safe use of equipment is found among many Topper customers including Anderson Windows, Detroit Diesel, Honda, Kia Motors, Ford, Chrysler, Aramark, Johnson Controls, Whirlpool, and Caterpillar. Project success starts with planning, including mitigating standard forklift training. Topper performs a detailed kaizen event and conducts Value Stream Mapping (VSM) documenting the current and future state. This effort then triggers simulations to test assumptions and verify the skillsets need to achieve potential for improvement. Previous post Topper Industrial Sponsored Educational Seminar at MODEX 2018 in ATL on April 10, 2018.